Earlier this year, we wrote a piece called "It all started here," which highlighted the various competing versions of when and where European immigrants began to colonize the part of North America that eventually became the United States. Whether it be Plymouth, Jamestown, Roanoke, or St. Augustine, every place has its own logic and interest in claiming to be the first site of European settlement. We thought that we had it all figured out . . . and then we visited Santa Fe. 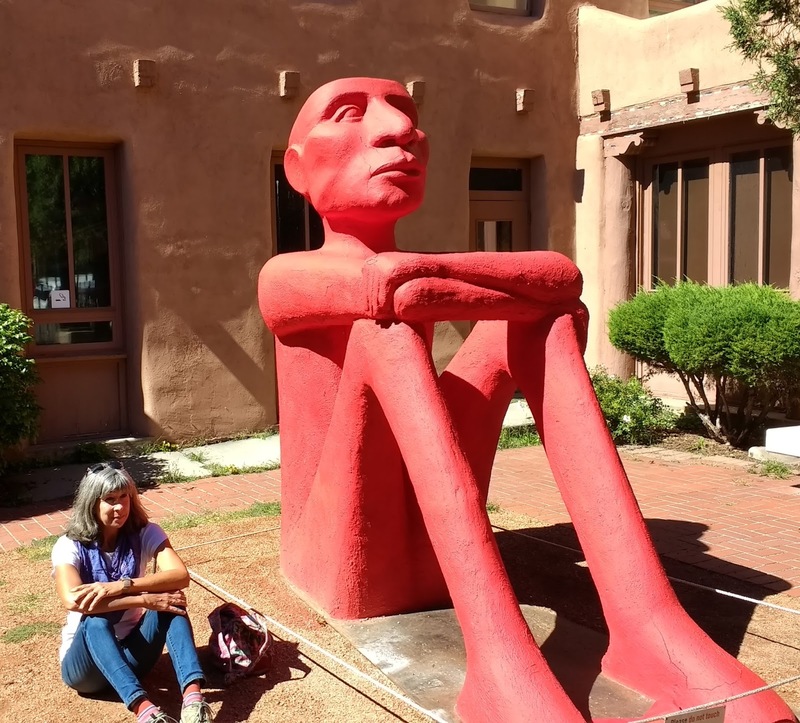 We spent a week in Santa Fe in September. After spending most of the summer in Colorado, we had begun working out way southwest to Tucson, our winter home this year. Neither of us had ever been to Santa Fe, and we were both looking forward to it. We had to fit our visit in before the craziness of the Albuquerque Balloon Festival began (and prices went up), so we had only seven days there. But we found that we really liked the place, although we can't figure out exactly why. It certainly wasn't due to the weather, which gave us rain on five of our seven days. It might be partly due to the Santa Fe style of architecture, seen clearly in the Museum of Art. Santa Fe was established in 1607, making it the second oldest city in the US, after St. Augustine, which was founded in 1565. But the Spanish were exploring in the New Mexico area, including Santa Fe, much earlier, as early at 1528. That puts them 37 years ahead of St. Augustine and a full 80 years ahead of Jamestown. Typical of a Spanish city of that era, the center of Santa Fe has an open square (plaza). Along one side is the Palace of the Governors, which was the seat of government during the early 17th century, when Spain ruled the place. It wasn't much of a palace, with dirt floors and livestock roaming in and out. But it still stands, and this is what it looks like today. The people sitting under the long porch are street vendors, each with wares for sale spread out on a blanket. It may be coincidence, or possibly by convention, but it seems that the shady area under the porch was reserved for street vendors with Native American ancestry, while street vendors who are more recent immigrants were selling elsewhere around the square. Santa Fe is the capitol of New Mexico. The government is not housed in the old Palace of the Governors, but rather has more modern and spacious digs a few blocks away. The capitol building is built in the round, and like much of the city is filled with artwork. The hallways serve as art galleries, as do many of the offices, including the governor's office. There's art throughout this city, which has multiple art museums and well over 100 art galleries. As our RV doesn't really have much wall space for art, we amuse ourselves by just enjoying all the art that we see. We also find other ways to amuse ourselves. Now back to the "it all began here" claim. Santa Fe might be second to St. Augustine, but it does claim to have the oldest house in what is now the US. Just a few blocks from the Palace of the Governors sits this little modest adobe structure, built in 1646. It is now home to a gift shop, with an odd layout and low ceilings. But it is 371 years old, and housing styles have changed a bit since then. This house was built and standing for 10 years before the Spanish began to lay out the street plan for St. Augustine. So maybe it all really started here. Stay tuned: we may yet uncover some earlier European settlements. We've been to only 26 of the states in our travels so far, so who knows what else we'll find?